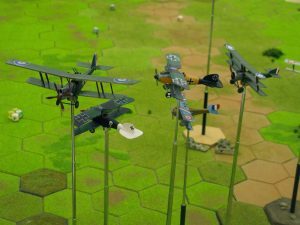 This multiplayer WW1 aerial game, re-scheduled from 24th January, will now be happening at the club on Tuesday 7th February. 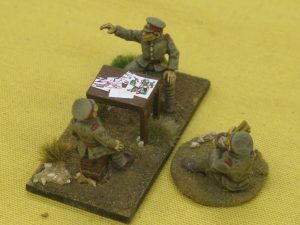 The game will be set in February 1917 over the Ancre sector, with the German Imperial Air Service out in strength to disrupt the Royal Flying Corps from completing an artillery spotting mission in support of the 63rd Division attacking Grandcourt. The Xmas break meant a lot of forced marching was unavoidable but there are two games scheduled for Turn Three already, so plenty of action to look forward to next month. 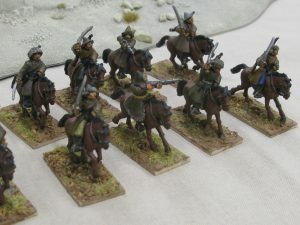 The Chinese Warlord and French Expedition are now neck and neck, with the other forces trailing behind, but anything can happen in the Back of Beyond! Initial reports are coming in of a major defeat for the Japanese Flying Column of Colonel Sushi Miyagi by the French Trans-Asia Expedition of Commandant Henri Lostagaine. Although details have yet to be confirmed, it would appear that the Japanese have suffered a significant setback, with losses in men, equipment and heavy weapons. 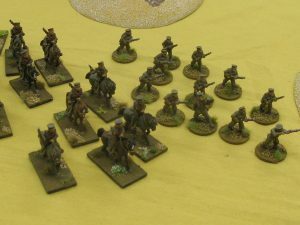 The French have now renewed their advance to Urga leaving the Japanese to lick their wounds and gather reinforcements from local Chinese Bandit factions. 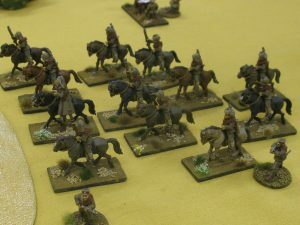 Wessex Wargamers Winchester has always had a long established and enthusiastic naval wargaming interest, with a wide range of periods and scales featuring in various club games over the years. 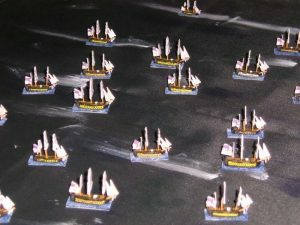 These have included Napoleonics in both 1/1200 and 1/2400, with a complete refight of the Battle of Trafalgar all the way down to one on one frigate skirmishes. 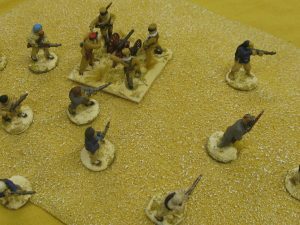 We have also played ACW riverine games in 1/1200th scales and ironclad clashes including the Battle of Lissa in 1/2400th scale. There is further scope for some Ancient and Medieval naval gaming but as yet this is an area that we haven’t really explored. A firm favourite is World War Two using Victory at Sea, with many club players owning rival fleets of Allied and Axis warships in 1/3000th scale. One club event is a U Boat vs Convoy multiplayer battle organised by the resident naval enthusiast, Dickie, which has been replayed several times and is always really hard fought. 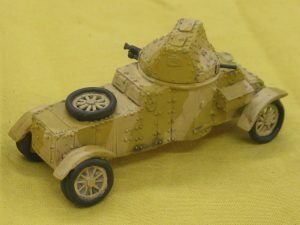 There have also been a few coastal warfare games in 1/600th scale, which is definitely an area in which there will be more games in the not too distant future. 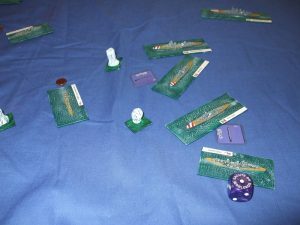 We have even stretched to some none too historical but very enjoyable VSF naval gaming in the form of Aeronef, including a club multiplayer Scramble for Africa campaign. 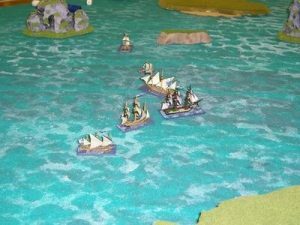 We’ve also been known to play a few pirate games using Galleys and Galleons in 1/450th scale. 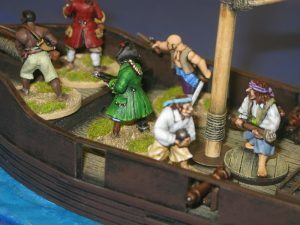 There is even the occasional game of piratical boarding actions in 28mm, with rival pirate gangs skirmishing across the decks of scratch built pirate ships. If you are interested in naval wargaming, drop us a line and drop into the club for an evening, where we will be happy run something nautical!